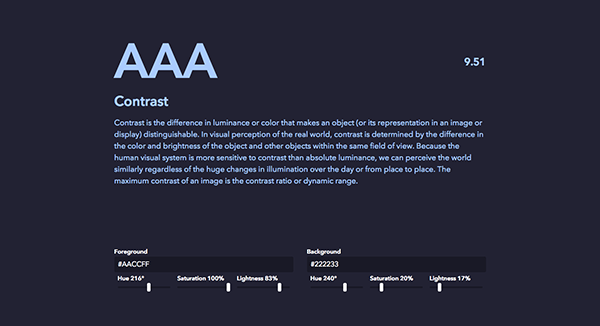 Are you checking color contrast in your design for optimal readability? 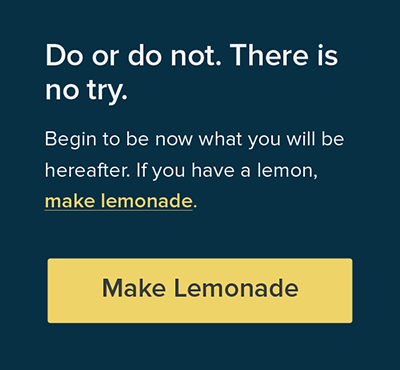 Learn more from @troz's simple method. 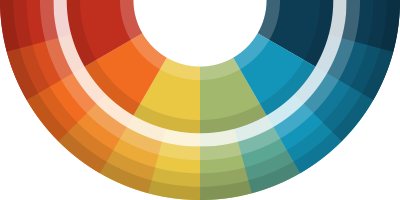 When you create color palettes for your web design projects, are you testing the color combinations for contrast? 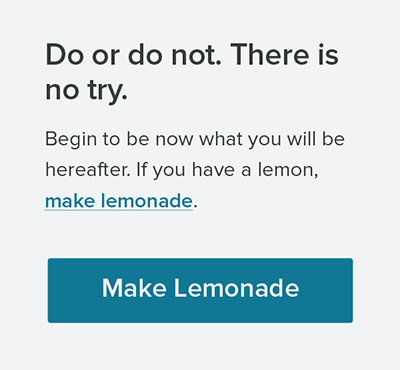 If you're not, you might not be considering the eventual readability of the design and thus losing potential audience. I’ve been working on a process to help me ensure good color contrast and readability in my projects. Thanks to some helpful color contrast accessibility tools, I think I have something that is working and wanted to share with others in the event that you find it helpful, too. I should mention that I’m far from an accessibility expert. My goal here is to simply show that a little bit of effort can go a long way when it comes to selecting colors with optimal readability in mind. Check out W3C for a more thorough explanation. Also, check out Contrast Rebellion for an interesting look at the contrast problem. 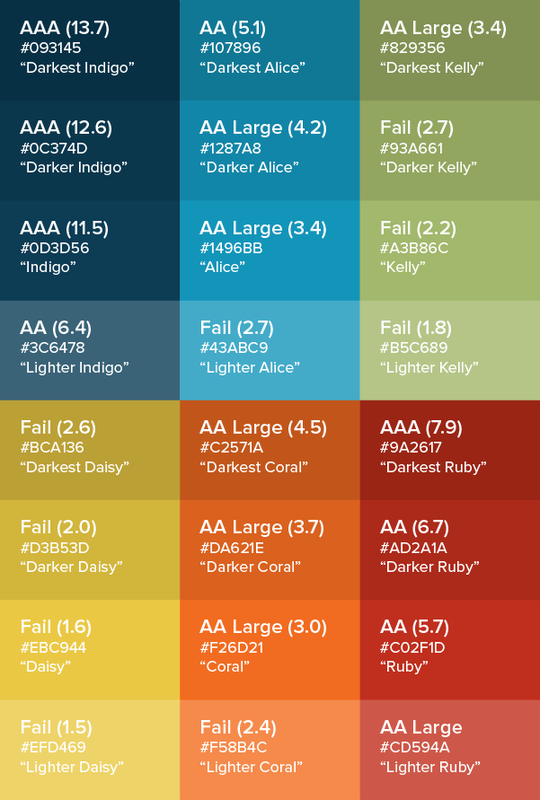 While you can use color contrast tools to help you establish a color palette, you can also use the tools to help find good options within an existing palette. In this case, I’m using a pre-existing color palette and showing how I'm using tints, tones, and shades to help create more color contrast options. My working color palette. From previous article, Add Colors To Your Palette With Color Mixing. Establishing tints, tones, and shades. From previous article, From Darkness to Light: Color Versatility Using Tints, Tones, and Shades. 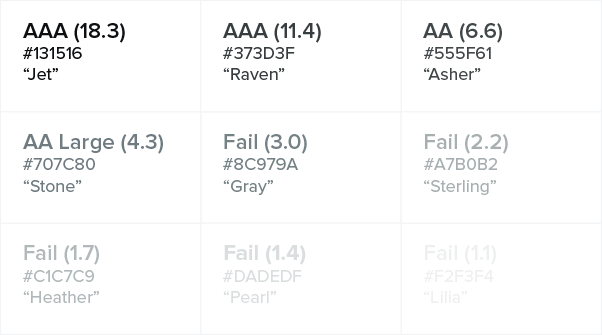 #373D3F or "Raven" is my lightest gray within a AAA accessibility rating. The next step is to find a good color option for buttons and links (the actions). I take a slightly different approach here. Instead of going for AAA, I’m looking for AA (a reasonable standard to strive for) so that I can get a brighter color to contrast from the static text and draw attention to important links. For these purposes, I'm testing white (#FFFFFF) in combination with various colors. The blues and reds have a higher success rate while the yellows and greens not so much. I go with "Darkest Alice" (#107896) for good combination of contrast and luminosity. "Ruby" (#C02F1D) is also a decent option. It’s good to identify some additional color combinations for attention-grabbing call-outs and other possible needs. My base example with dark gray "Raven" text and a bright "Darkest Alice" blue for links and buttons. Example with darks on a lighter background. Example with lights on a darker background. The last step is to keep a reference guide handy with your test results while adding notes to your style guide. 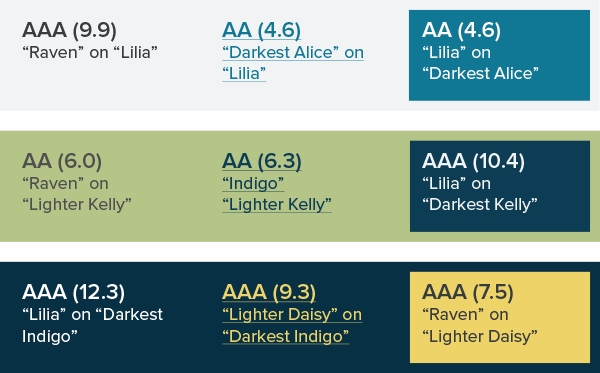 Your clients and audience will be impressed that your colors are chosen for thoughtful reasons -- optimal readability -- and you'll sail through QA testing with additional options should you need them. Sample documentation for a style guide. Reading Text: For reading purposes, find a high contrast pairing for most of your body copy (the heavy lifting). Extra, Extra! : Create and document various color combinations for call-outs intended to draw extra attention.